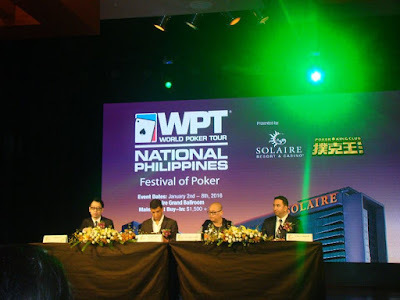 The World Poker Tour annouced that its plans to hold the Season XIV WPT National Philippines Festival this January 2-8, 2016 at the Solaire Resort and Casino, a leading Poker and resort destination in Asia. 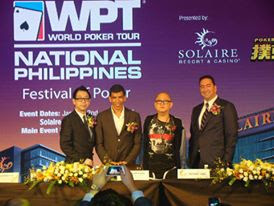 The World Poker Tour (WPT) returns to Manila after holding a successful Season XIII at Solaire Resort and Casino last year. Solaire is proud to host the WPT competition on its 2nd consecutive year and looks forward to welcoming some of the world's best poker players in the Philippines. Solaire will play host to a $1,650 buy-in WPT National Main Event with other side events that includes $330 buy-in deep-stacked event, a $275 buy-in pot-limit Omaha event, a $165 buy-in Ladies event, a $5,400 buy-in High Roller and a $770 buy-in second-chance tournament. In the recently concluded WPT National China Main Event at MGM Grand Sanya, Top 882 Sanya players finished in the money totalling nearly $1.4 million prize pool. WPT National Philippines Festival commences on January 2 with the $275 buy-in, $50,000 guaranteed Poker King Cup. It then heats up with the start of two-day $200,000 buy-in Super High Roller on January 3, the largest buy-in tournament in the history of WPT. The Super High Roller will pit top professionals against wealthy enthusiast to compete in this massive buy-in activity. At leaaast six $180 buy-in satellites to the WPT Main Event are set from January 2 to 4, 2016. The $1,650 buy-in WPT National Phiippines Main Event begin on January 4 and end the following day. Players who bag chips on Day 1A may play again on Day 1B and their largest stack will be put into play on Day 2.